Ever ignore the strange pear-shaped green vegetable at the produce stand? Mirliton or coyote squash is easy to transform into a dish everyone will love. Mirliton dressing with seafood and ham is one of my favorites and is an easy dish to cook in larger quantities for the week. In addition to dressing, it can also be pickled, sliced thin for stir fry and curried among many other uses. 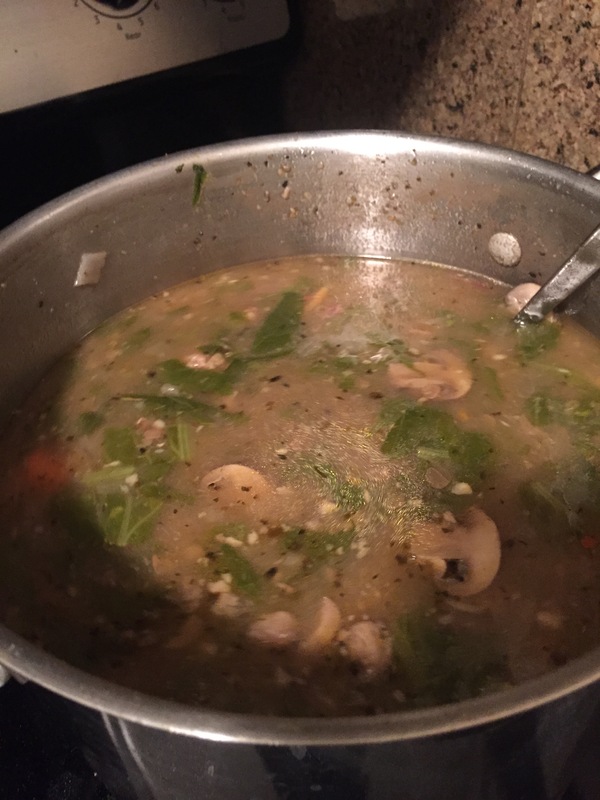 I used the whole vegetable, skin and all for added nutrients. They are out in abundance and an easy win to add to your shopping list. For the protein, I like ham and shrimp; however it is easy to substitute ground meat or ground chicken for the ham if you do not eat those meats. I did make my own bread crumbs for this dish and will include that recipe below. Certainly your favorite brand will work in this dish as well. Check out the recipe below and share your thoughts. Rinse mirliton and boil in a pot over high heat for 30 minutes. In the last 10 minutes of boiling, toast bread, then grind it, the oats and the flaxseed in a food processor, blender or other device. Place in a baking dish and add seasoning and 2 tsp of olive oil. Mix well and brown in the oven for 10 minutes. Strain mirliton, rinse in cool water and let cool for 15-20 minutes. While the mirliton cools, rinse and chop kale small. Dice onion and sauté both in 1 tsp. oil. Peel shrimp and chop before adding to skillet and cooking. Chop mirliton small and add to the skillet. Add seasoning and mix well. Add in breadcrumbs and mix well. Pour mixture into baking dish and bake for 10-15 minutes until top is lightly browned. Cold weather calls for soups, gumbos and comfort food. One of my favorite comfort meals as a kid was stewed chicken. It’s something easy to make, whether you are breaking down a whole chicken yourself or taking some help from the store with a mixed pack or a package of your favorite piece of meat. It’s helpful, when you can, to go for the whole chicken whether the store cuts it up or you and you can save parts for gumbo or a homemade stock for some chicken noodle soup for another week. Stewed chicken is simple dish and easy to serve over rice or with potatoes. I like to double down on the veggies with sautéed greens and a side salad. The cook time is about 1 hour and 15 minutes, though the slow cooking for the latter 35 minutes can be spent elsewhere in the house with a set phone or stove timer. Though a standard 10″ deep pan will do, a cast iron pot or a Dutch oven. Check out the recipe below. 1. Add olive oil to a large pot over medium heat. 2. Rinse chicken and pat dry with a paper towel before sprinkling on salt and pepper. Brown chicken in 2-3 batches for 2-3 minutes per side. Add batch to a plate once browned and repeat. 3. Add butter and then flour to melted butter. Using a fork or whisk, mix flour continuously for 3-5 minutes, browning in the pan dripping and butter. Once brown, add water or stock and remaining seasoning and mix with the fork or whisk. 4. Peel and mince garlic. Peel and dice onion and bell pepper. 5. Add onion and bell pepper, garlic and chicken back to the pan. Top and reduce to medium-low heat to simmer for 30-35 minutes. 6. Put on rice 10 minutes after chicken begins to simmer so that food is ready about the same time. I’ve always heard that curiosity killed the cat, but that certainly doesn’t ring true when cooking. I went to the Red Stick Farmers Market this past Saturday and was inspired to create something warm to fight off the cold day. I picked up some beef marrow bones and oxtail from the Gonsoulin farmers to make a rich broth for a beef and veggie soup. I’ve never cooked with either but was curious to find out what difference it could make in a dish. The flavor was beyond incredible paired with garlic, onion and herbs. I’m certain a pot of this will be a winner and should make 10-12 servings for easy meals during the week as the Christmas preparations are underway. Please see the recipe and instructions below and be sure to share your thoughts if you try it. This will be my last post until after the holidays. Merry Christmas and Happy Holidays! Add marrow bones and oxtail to a large pot and cover in 8 quarts of water. Peel and chop onions and add to pot. Remove garlic cloves from each head, peel off the skin, cut off the hard end and mince into mid-sized pieces. Add to pot. Bring to a boil over medium-high heat. Once it begins to boil reduce to low-medium heat (3 out of 10). Let boil for an hour. Peel and chop carrots into 1 to 2 inch thick pieces. Add to simmering pot. Let cook for 30 minutes. Rinse and slice potatoes into 1 inch thick slices before cutting in half. You want the potatoes to serve as a thickening agent. Let cook for 15 minutes. Slice mushrooms into 1/2 inch thick pieces, including stems unless tough. Do not rinse mushroom caps before slicing. If you see dirt, remove it with a damp paper towel. Add mushrooms and all of the seasoning to pot. Let cook for 30-45 minutes. Stir pot and use a large metal spoon to remove some meat from the bones if tender enough to break with the spoon. Wash mustard greens by submerging them in a bowl or sink of water for 10 minutes. Chop the greens in groups of 4-5 leaves, into thin strips. Cut long strips in halves or thirds. Add greens to pot and let cook for 10-15 minutes before cutting off heat. The residual heat will continue to cook the soup. Taste and add additional salt and pepper to taste. Serve in a bowl and enjoy. Note: I made a ham and cheese sandwich with microgreens to go with my soup. It can be served alone or with the sandwich addition of your choice. Though the weather cannot decide if it wants to be warm or cold, my taste buds certainly decided on gumbo. Gumbo can be made in lots of ways. 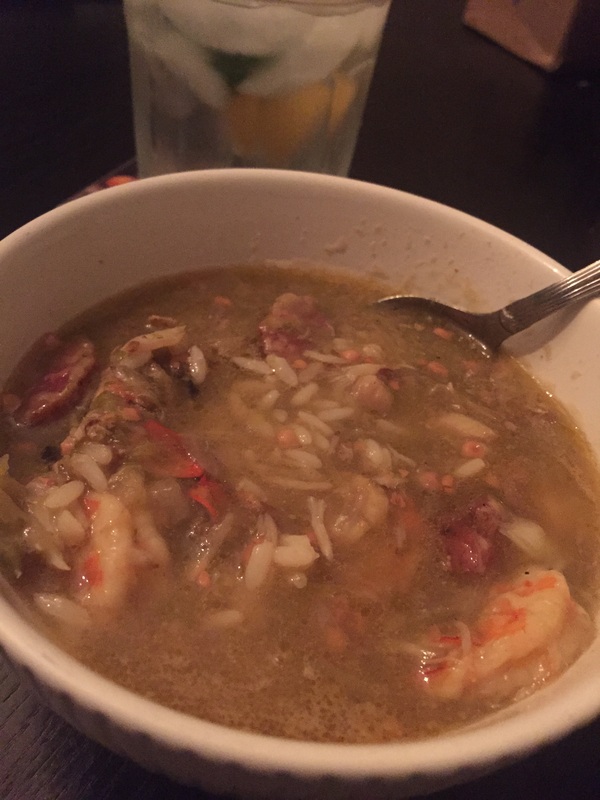 I grew up eating chicken and sausage gumbo, a bit of everything gumbo and my favorite, seafood gumbo. I have fond memories of trips to Castnet’s in New Orleans, which meant bringing out the newspaper and paper towels to peel and devein shrimp. With this recipe, I solemnly admit that my baby brother, of 7 minutes, is also a great cook. He created an amazing gumbo, sans roux, that uses another favorite and Louisiana star, okra, which is used to thicken the gumbo. My only tweaks were to add whole crab and everything local-fresh crabmeat picked two days ago, fresh shrimp that I peeled and deveined myself, Cutrer’s sausage and locally grown and harvested sassafras all from the Red Stick Farmers Market. I essentially doubled everything to make enough to freeze in individual servings. I hope this dish brings you great flavor and a take on a classic. Please see the ingredients and directions below. As always, please share your thoughts and feedback. 1. Chop onion. First cut off each end with sprouts to stabilize the onion, then, placing a flat end down, cut the onion in half. Peel the skin and first layer off of each half, cut into thin strips and then chop the onion. Mince garlic by popping the cloves out of their pods and chop into small pieces. 2. Place onion and garlic into a large 7-8 quart pot, over medium heat, with an inch of water to prevent sticking. 3. Wash and chop okra into 1 inch pieces. If using frozen pre-chopped okra, defrost it by placing the bag(s) in the fridge overnight. 4. Add okra to pot and let it cook for 15-20 minutes stirring occasionally. Add all of the water, top the pot and bring to a boil. This will cook out the slim of the okra but also thicken the gumbo. Some of the liquid will also evaporate. 5. Slice sausage into 1/2 inch thick pieces and add to the pot. 6. Break whole crabs in half to stretch your pound, and add the piece to the pot. 7. Add all of the seasonings, Reduce heat to low-medium and top the pot. 8. While the gumbo is cooking, peel and devein your shrimp. This should take 45 minutes to an hour. Note: fill one medium-sized bowl with ice and a little water to place your shrimp in that have been peeled and deveined. This will keep them chilled until you are finished. If using frozen shrimp, let the gumbo cook for the 45 minute to an hour timeframe. 9. Add shrimp and crabmeat to the pot. Let cook for 10-15 minutes. 10. Turn off pot and enjoy. Note: If serving with rice, start the rice before adding the shrimp and crabmeat to the gumbo.